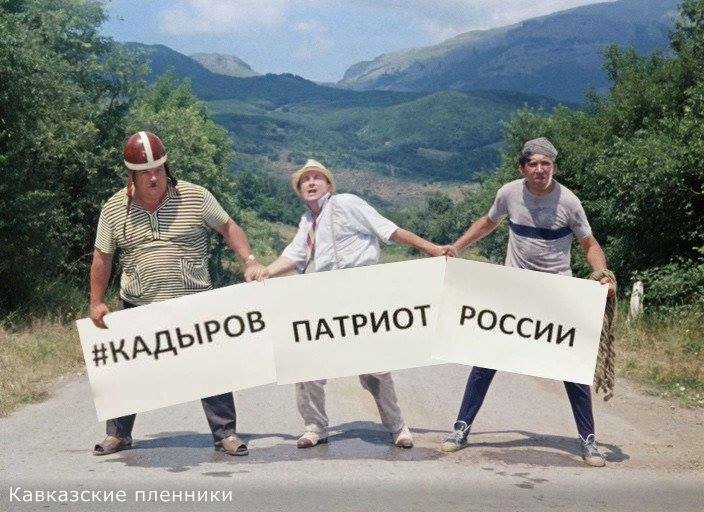 “Captives of the Caucasus: #Kadyrov Is a Russian Patriot.” A mash-up by Anatoly Veitsenfeld of a famous scene from the beloved Soviet comedy Kidnapping, Caucasian Style (Leonid Gaidai, 1967) and the recent social media campaign by pro-Kremlin celebrities, who have been photographed holding pieces of paper with this message printed on it. Thanks to Comrade EM for the heads-up. Everyone has been getting drawn into the virtual fight with Kadyrov. I, too, have been outraged by what has been said and done in Chechnya. But I am afraid of certain hasty generalizations that have already begun to take shape amongst the “opposition” (by which I also mean a certain detachment from the authorities, not necessarily confrontation with them). First, it is shortsighted to turn the fight against the, so to speak, Kadyrovshchina into a fight with the Chechens. This is the principle of collective guilt all over again. We are falling into the same trap without solving the problems but only aggravating them. Kadyrov does not represent all Chechens. There are many people opposed to him, both moderate liberals and more aggressive radicals. The majority of people simply live their local lives and keep their mouths shut. They are occasionally dragged off to pro-Kadyrov rallies and forced to hold placards and shout slogans, but that does not mean they are ardent Kadyrov supporters. We just need to keep this in mind. Second, the current regime in Chechnya is not something “Islamic,” “Caucasian,” “Asian,” and so forth, epithets that many liberals have been quick to pin on it, thus reproducing the white man’s colonial language. The Kadyrovshchina is a projection of the regime in the Kremlin. The Kremlin created it, the Kremlin has financed it, the Kremlin controls it, and one of the reasons it has done this has been to divert attention from itself. The current Putin regime and the Kadyrov regime, as part of the former, are not some kind of “Asian backwardness.” They are the peculiar system that emerged in the wake of Soviet modernization, with all its illusions, unfulfilled projects, traumas, and its incapacity for recycling this legacy in the post-Soviet period. As a consequence, we see a strange modern archaism or peripheralization. Third, jettisoning Chechnya and punishing the Chechens can hardly solve the problem. Where we would jettison them? How would we punish them? We need to change the regime in the Kremlin, to establish a whole new regime in Russia, to create new development programs or programs for overcoming peripheralization, and as part of these programs think about how the former borderlands, colonies, and Third World can be included in this development, rather than building a wall they will beat against until they smash it. Excellent article, lots of good information and opinions.